St. Padre Pio was born on May 25, 1887 in Pietrelcina, southern Italy. He was tutored privately until his entry to the novitiate of the Capuchin Friars at the age of 15. Of feeble health but strong will, with the help of grace, he completed the required studies and was ordained a priest in 1910. Padre Pio considered the Casa Sollievo Della Sofferenza (Casa) his “Work”, inspired and blessed by God, to be a haven of relief from suffering for all of God’s children in pain in body or soul. It is a model community of Catholic Christian health delivery, and has grown into a regional referral centre of international renown. Today, with over 1,000 beds and services comparable to most academic research centres of excellence, the Casa is thriving by God’s graces in one of the most remote, desolate and poorest areas of Italy…atop Mount Gargano, four hours from Rome. He was Beatified on 2 May 1999 by Pope John Paul II and on June 16, 2002, over 500,000 Padre Pio devotees gathered in Rome to witness Pope John Paul II proclaim Padre Pio, “Saint Pio of Pietrelcina”. The Feast of Padre Pio is celebrated on the Sunday closest to the 23rd September each year. 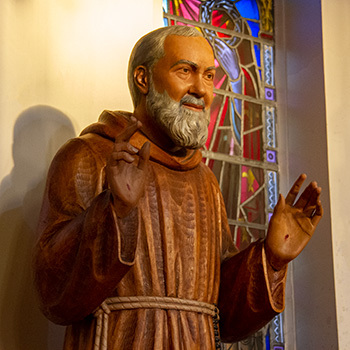 For resources on Padre Pio click here.